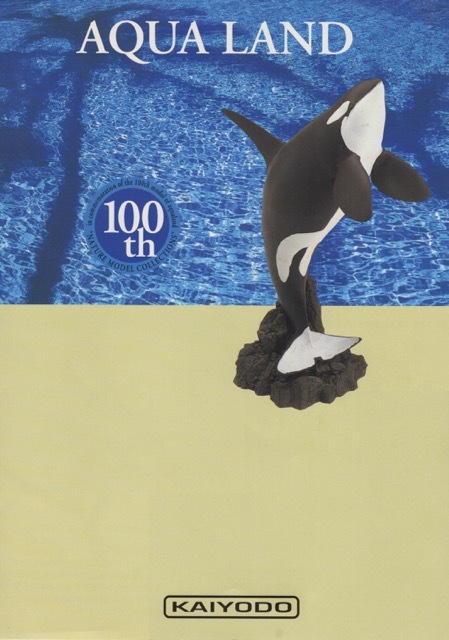 Found this catalog for the commemoration of the 100th model added to the series. I am lucky enough to have a few of these. Kaiyodo does phenomenal stuff in my opinion!! Some of these may still be available on eBay if we're lucky. I have the vinyl Sperm whale ( AVL-101W), Great White Shark (AQM-014), Whale shark (AQS-0900). Bottle Nose Dolphin (AQM-036W, & Coelacanth (AQM-0200). I am DESPERATELY looking for the Humpback Whale (AVL-002W)! I adopted a Humpback years ago and I want to pint this in the markings of "my" whale!! 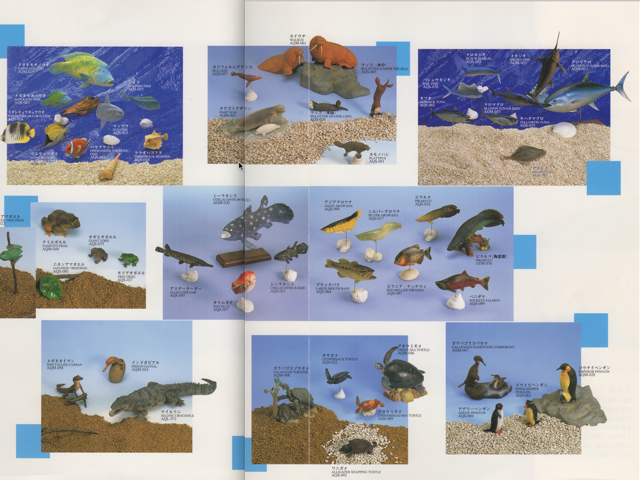 I've never seen the whole series before--I don't have any of the Aqualand, because I can't find the one model I 'desperately' need--the silver arowana. And now I find out that there is a gar as well. So now there are two models that I need to get my hands on. And if that one model is a lancetfish, the list may rise to three because I doubt it will matter much anyway. But even on the Japanese auction sites these are nearly impossible to find--and even harder to afford. Where did you find the catalog? Is it possible to find larger images? Was it a website? EDIT--It turns out, I do have one--a broken manatee with no base. If I had to pick one out of the 100, that would be probably in my bottom 5 (not big on the mammals myself), but it was part of a big lot of random Japanese figures. All those cool critters and not a single crustacean? That's very un-Kaiyodo like. Ack. I've been a big fan of Kaiyodo when they were a garage kit company in the 80's. 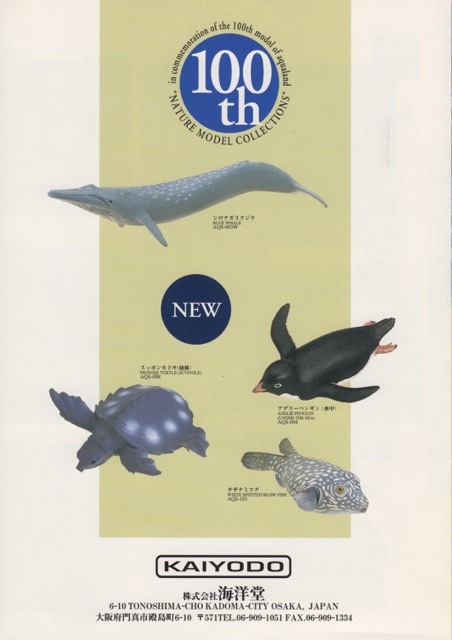 Catalog came from a friend I purchased the Whale Shark & Great White for almost 15 years ago. I remember talking to you about that--I admit I'm surprised there isn't even a spiny lobster or something. Unless there are more, after the 100th model (I've see pictures of different ones not on these pictures). And would it be possible to get bigger scans? For me, I just want to see the last page bigger, but I'm thinking some people might want to see the other ones as well. Whatever. New figures are awesome . These aren't new--they are from several years ago, and are no longer produced. Meaning that all of these pretty pictures are just here to make us all sad. Never a truer statement has been made haha. Really?. I didnt know it friend. Thank you. Not really--they're out of production and were pretty expensive even for the time--so there aren't that many out there. On top of that, whoever does have them is probably pretty aware of what they are, and their scarcity and worth, and we won;'t be seeing most of them anytime soon. It would be nice if Kaiyodo would just re-release them. They haven't even been tackled by the usual bootleggers and copiers, so the market probably still exists. But then, kaiyodo doesn't even appear to be interested in releasing their last 3 waves of the Aquatales special issue, so again unlikely. No inverts?! that's a bit of a surprise from Kaiyodo. Those cormorants and freshwater fish are practically making me drool. But then, kaiyodo doesn't even appear to be interested in releasing their last 3 waves of the Aquatales special issue, so again unlikely. Why would you think so? I'm sure we will soon see the release of at least the next six figures. Patience. friends! I'll try, I'll try... Since there was only very little time between the release of series 1 and 2 I had assumed it won't be long before we'd see the other series become available, too. So I was wondering why nothing happened, yet. There were no releases all last year--and word is that the first two series didn't sell well. Possibly because most of the truly exciting ones were being held for the latter 3 releases (as exciting as more of the usual species of whales & sharks are, of course). Price may also be part of it, but who knows. No matter what, Kaiyodo appears to be in no rush to release those next sets.